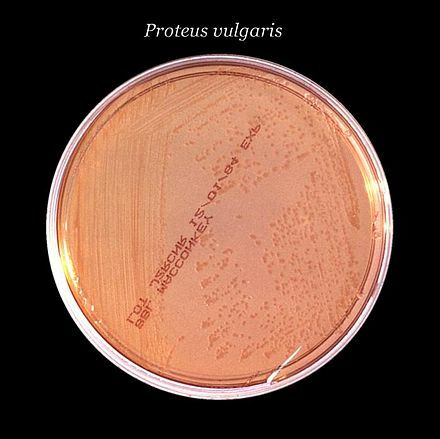 A MacConkey agar plate with an active bacterial culture. It contains bile salts (to inhibit most Gram-positive bacteria), crystal violet dye (which also inhibits certain Gram-positive bacteria), neutral red dye (which turns pink if the microbes are fermenting lactose). There are many variations of MacConkey agar depending on the need. If the spreading or swarming of Proteus species is not required, sodium chloride is omitted. Crystal violet at a concentration of 0.0001% (0.001 g per litre) is included when needing to check if Gram-positive bacteria are inhibited. MacConkey with sorbitol is used to isolate E. coli O157, an enteric pathogen. The medium was developed by Alfred Theodore MacConkey while working as a bacteriologist for the Royal Commission on Sewage Disposal. Using neutral red pH indicator, the agar distinguishes those Gram-negative bacteria that can ferment the sugar lactose (Lac+) from those that cannot (Lac-)fermentation. This medium is also known as an "indicator medium" and a "low selective medium". Presence of bile salts inhibits swarming by Proteus species. Non-lactose fermenting bacteria such as Salmonella , Proteus species, Yersinia , Pseudomonas aeruginosa and Shigella . Some organisms, especially Klebsiella and Enterobacter, produce mucoid colonies which appear very moist and sticky. This phenomenon happens because the organism is producing a capsule, which is predominantly made from the lactose sugar in the agar. A variant, sorbitol-MacConkey agar, (with the addition of additional selective agents) can assist in the isolation and differentiation of enterohemorrhagic E. coli serotype E. coli O157:H7, by the presence of colorless circular colonies that are non-sorbitol fermenting. MRS agar (culture medium designed to grow Gram-positive bacteria and differentiate them for lactose fermentation). ↑ "tmc.edu". Archived from the original on 2008-11-04. ↑ Anderson, Cindy (2013). Great Adventures in the Microbiology Laboratory (7th ed.). Pearson. pp. 175–176. ISBN 978-1-269-39068-2. ↑ MacConkey AT (1905). "Lactose-Fermenting Bacteria in Faeces". J Hyg (Lond). 5 (3): 333–79. doi:10.1017/s002217240000259x. PMC 2236133 . PMID 20474229. ↑ MacConkey AT (1908). "Bile Salt Media and their advantages in some Bacteriological Examinations". J Hyg (Lond). 8 (3): 322–34. doi:10.1017/s0022172400003375. PMC 2167122 . PMID 20474363. ↑ "Medmicro Chapter 26". Archived from the original on 2008-07-06. Retrieved 2008-12-11.